The old Banyan trees at the Hawi market provide comfortable shade. There is a carnival atmosphere at the Hawi market. Colorful tents, music playing, banners flying, lots of people milling around; many visiting and catching up with each others’ news and talking story. This is a very lively market. 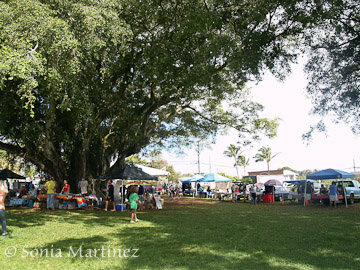 And there is not a bad spot for any vendor under the two huge and ancient banyan trees that give the market its name. There are some preferred spots, such as around the trunks of the trees, but no bad ones, as the shadows under the trees spread so wide that everyone is covered. Delicious aromas waft in from the Chaba Thai Cuisine tent. Owner Chaba Chalker, a private chef and caterer, has a most amazing kitchen setup and has been offering an assortment of Thai food to the community from this tent every Saturday for the last ten years. Husband and wife team Chaba and Rick Chalker provide table and chairs for customers inside the tent and also beneath one of the trees, enhancing the ohana feeling. When asked how they got started, Chaba says she always liked to cook and was a chef on Thai night at a local restaurant, then later decided to start selling at the farmers market. At this time it seems the best selling item is the "Mix Plate," which features some of almost everything on the Saturday menu. 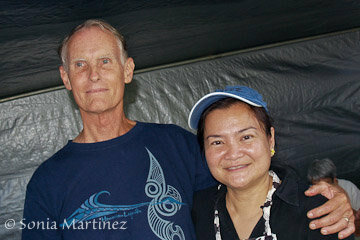 Chaba and Rick Chalker of Chaba Thai Cuisine. Both Chaba and Rick say that the best part of the market is the very friendly atmosphere where locals gather to talk story, eat and shop. They thank the Surety Kohala Corp., which allows them to use the near perfect location under the huge banyan trees in the center of Hawi town. We found Stan Rohl and Dawn Marlowe’s "Tea, Chai and Coffee" set up hugging one side of one of the huge trees. A gas stove provides the heat for Dawn’s organic teas and coffee brews. Dawn grows and handcrafts her tea mixes and grows many of the herbs she uses in her teas. What she can’t grow, she buys from other organic growers. One of Dawn’s favorite mixes is Herbs de Provence, composed of thyme, savory, basil, fennel and lavender. To further the "green" message, they avoid disposable serving ware by providing ceramic mugs that their customers can carry around with them while shopping and return when finished. Handcrafted soaps are made and sold at the "Hula Hands Soap" tent. Making soaps from their own kitchen was the idea and entrepreneurial effort of three brothers in their early to mid twenties. Besides making the soap, Kawika, Kaikea and Kaehu Mattos, also make their own labels on a computer with cute graphics and catchy names for each combination of fragrances. Vanilla Strawberry, Cherry Almond Oatmeal, Aloe, White Orchid, Shabby Chic, Tropical Fruits, Café Mocha, Lavender and Paniolo Country were just a few of the selections available. Auntie Helen Roloff, one of the original market founders. 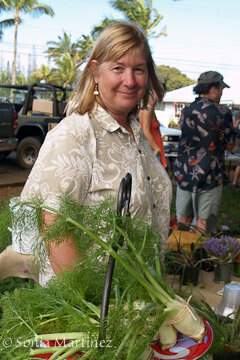 Auntie Helen Roloff was one of the original founders of the Hawi farmers market when it was held on borrowed space in the parking lot at Luke’s Place, just across the street from the present location. Auntie Helen has been selling organically grown vegetables from her own Victory Garden and a delicious mango seed jam for the last 8 years. According to Rick Chalker, the market’s manager, she is the heart of the Hawi market. 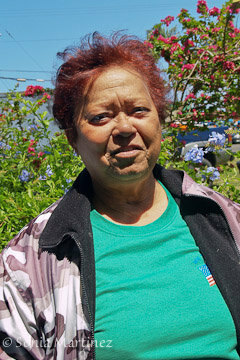 Besides participating in the market, Auntie Helen also has been catering for a local lu’au for many years. Another interesting booth was "Weniki Harvest" owned by Wendy and Clark Kucera. The Kuceras have been participating in the market for five years and grow and process macadamia nuts from their 800 foot elevation farm near Hawi. During the season they sell bagged, roasted and raw macnuts as well as macnut pesto, macnut brittle and banana macnut bread. Besides macadamia nuts, they also grow an assortment of tropical fruit and have a garden from which they sell chives, green onions, eggplants and other produce. Holly Algood hasn’t been selling under the banyan trees for very long, but her mixture of aquaponic organically grown produce and herbs, along with homemade muffins and other baked goods made from organic ingredients and no added sugar or gluten, have become a popular stopping spot for customers. The buildings at the Algoods’ farm in North Kohala are constructed using "green" technologies, the farm is powered by sustainable wind and solar energy, and it has a water catchment system for the agricultural crops. Holly Algood with her organic produce. Using aquaponics the Algoods grow basil and other culinary herbs, lettuces, spinaches, strawberries, onions, leeks, Japanese eggplants, kale, broccoli and several taros. They continue to experiment with other crops. On their land they grow coconuts, figs, bananas, papayas, olives, pumpkins, squashes, sweet potatoes, medicinal, culinary herbs, cactus, and assorted trees. Some of these crops are new and not yet being harvested. They also make pesto, juices, and assorted baked goods. Using mostly their own products they buy organic ingredients to supplement when needed. The Algoods’ farm has been in business since 2008. All of their practices are organic and they are currently completing their organic certification application. Holly says the Hawi market has been steadily growing and is becoming more vibrant each week. It is the local hot spot to connect with friends and neighbors. Location: Under the banyan trees in the heart of Hawi, corner of Akoni Pule (Hwy 270) and Hawi Rd (to Waimea). Type of Market: We encourage locally produced farm related items but we do not exclude anyone. Locally sourced and made crafts are also welcome. Number of vendors: Increased from 10-15 to around 30 at present. Diversity of products: Diversity has increased commensurately with the vendors. Vendors come from: Most are from North Kohala, but a few come from Waimea, Kona, Waikaloa, Kau and Hamakua. Current Products: Veggies, fruit, herbs, plants, flowers, eggs, honey, coffee, mac nuts, jam and jelly, value added products, Hawaiian crafts, handmade soap, distilled aromatics, handmade jewelry, plate lunches, ethnic foods, hot coffee and tea, baked goods, massage. Growing methods: conventional- unknown; certified organic- 1; unsprayed/claimed organic- 4-5. Best selling products: Vendors' income is private. Best guess: Plate lunches, baked items, produce. Special Events: Occasional live music.